The 1887 Cox Building is one of three historic buildings of Maysville re-created in 1/12 scale. Like many miniaturists and collectors, I choose and commission pieces because they remind me of something special. It could be time I’ve spent with the artisan or I’ll acquire an item because I know another collector once treasured it, too. Others pieces are sentimental to me for personal reasons like the three 1/12-scale structures representing buildings in my hometown of Maysville, Kentucky. The Cox Building, in particular, holds many memories—not just for me, but for the entire community. The 1887 Richardsonian Romanesque brick structure was right down the street from me growing up. 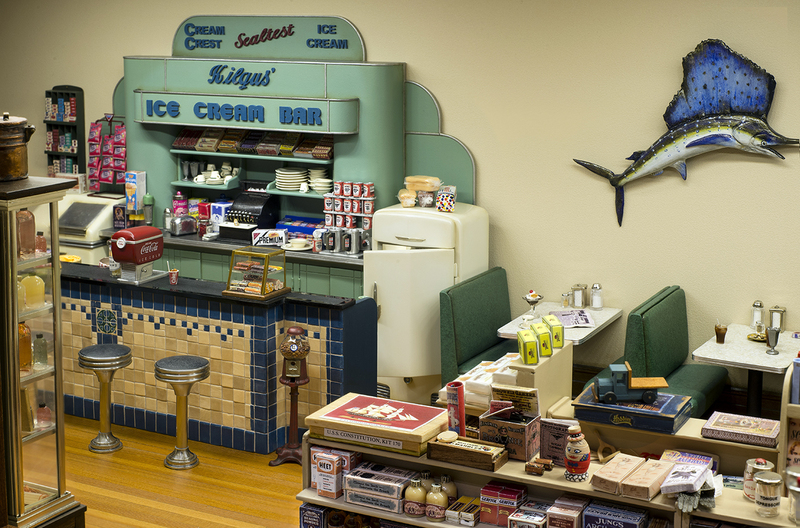 It housed many businesses over the years: a post office, hat shop, auto parts store, grocery, toy shop and confectionery … even a sanitarium. I took piano lessons at the music studio there and pocketed a penny apiece for every coat hanger I returned to the dry cleaners. But perhaps my most vivid memories are from Kilgus’ Drug Store, where I spent many teenage hours at the soda fountain. When I commissioned Ashby & Jedd in 2006 to create the Cox Building, that was the era and interior I chose to replicate. Do you remember any of these items? Marble for scale. 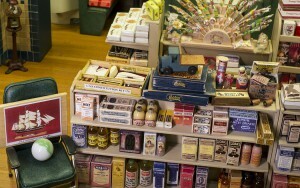 Visitors to the gallery can spend hours peering into the miniature looking at the many items that are part of our pasts. Why just take a look at the shelves. The drug store items in vintage packaging are amazing, as are all the soda and candy pieces. The scene seems to spark memories for everyone who sees it whether they are from Maysville or not and I love hearing their stories. But as much as I appreciate the nostalgia it inspires, I have to say this miniature’s shining moment may have been for historical purposes. In 2010, the real Cox Building caught fire. In restoring it, architects measured the miniature so builders could precisely reconstruct the roofline angles. The Cox Building luckily was restored and is now listed on the National Register of Historic Places. 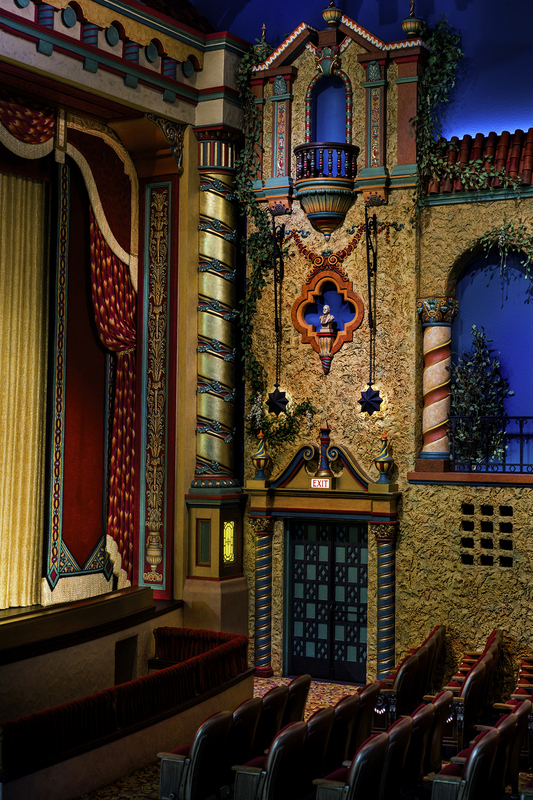 As a child, Kaye lost a ring inside the Russell Theatre. Ashby & Jedd hid a 1/12-scale ring inside the miniature. 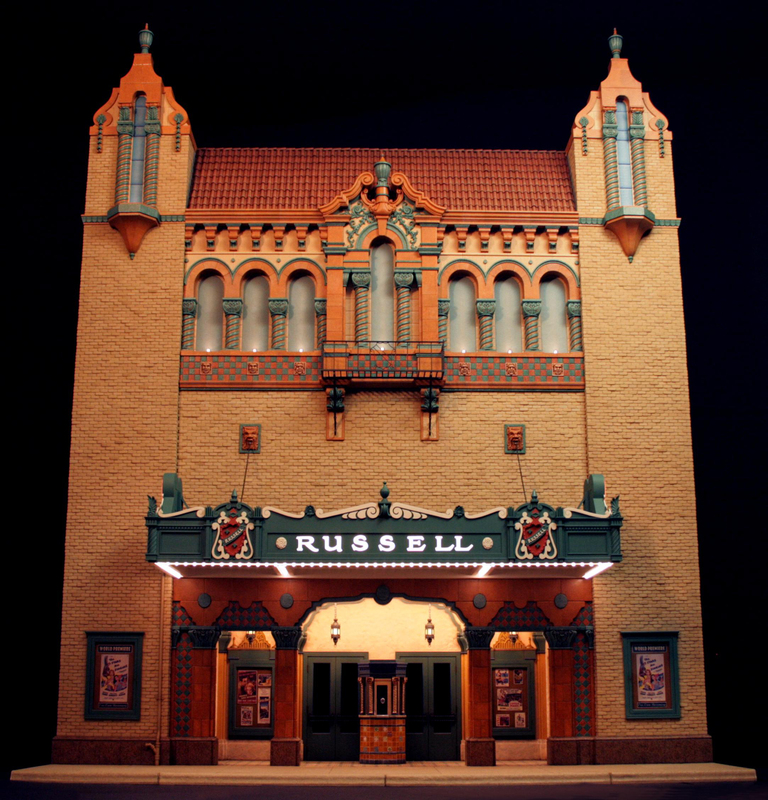 Another Maysville building in miniature, also on the NRHP, is the Russell Theatre. The real theater was actually across the street from my house and I cannot begin to count the number of movies I saw there. As life would have it, however, the one movie I was unable to attend (I had chickenpox) turned out to be the most famous event in the theater’s history. Hometown girl Rosemary Clooney persuaded movie execs to hold her big screen debut at the Russell. I remember looking out the window as she arrived. The town was deliriously proud and lines were around the block to see The Stars Are Singing. I would later see the film, but in my mind it was always Rosemary’s character that made her a star. As a girl growing up in the ’30s and ’40s in segregated Kentucky, Rosemary’s best friend, Blanchie Mae Chambers, was black. When they went to the movies together, rather than sit on the main floor where Blanche was not allowed, Rosemary joined Blanche in the designated “black section” of the theater. About a decade later when the town celebrated Rosie’s movie debut, the budding star insisted her best friend be part of the festivities that day. If Blanche could not participate, said Rosemary, “There would be no parade.” They remained life-long friends. 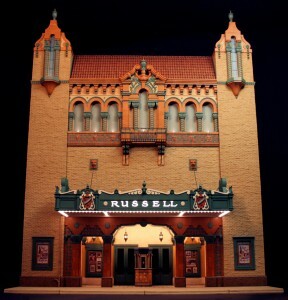 The Russell miniature, like the scale Cox Building, also served the community by helping to raise money for the restoration of the real 1929 structure. More than 11,000 bricks in 1/12 scale were cut from actual bricks to make the miniature and we raised funds by allowing the public to purchase them for $1 each. Patrons could then have a name engraved on the brick and placed on the façade of the miniature theater. It was quite a success. 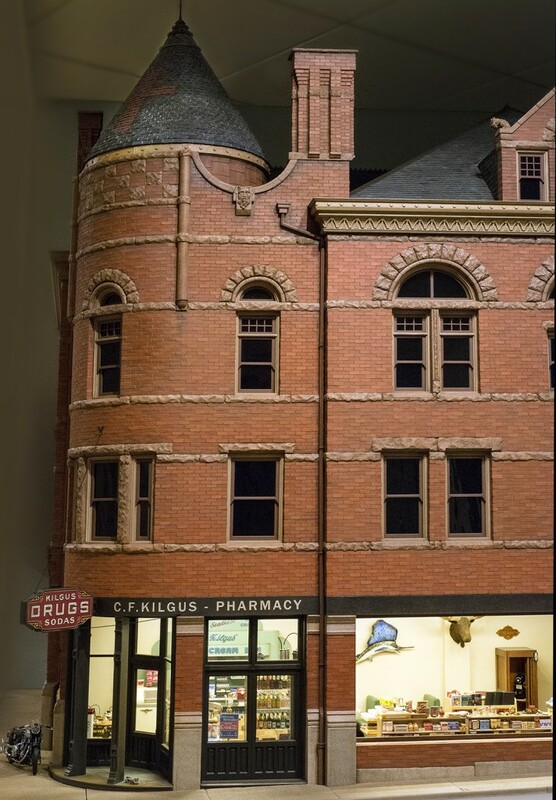 When I commissioned these pieces, I admit it was to preserve memories, but these 1/12-scale structures have contributed in a much bigger way than I ever thought possible, which was to preserve the buildings themselves. If you visit Maysville to see the KSB Miniatures Collection, I hope you will also stop by the real historic structures—art forms in their own right—and appreciate the scope of what makes our miniatures so important. See the third Maysville structure in miniature, the Bethel Baptist Church, in the October 2015 blog. The detail is incredible! I could look all day!